On 3 April 2012, two exhibitions of early children’s literature will launch at Exeter Central Library and the University of Exeter’s Research Commons, Old Library. 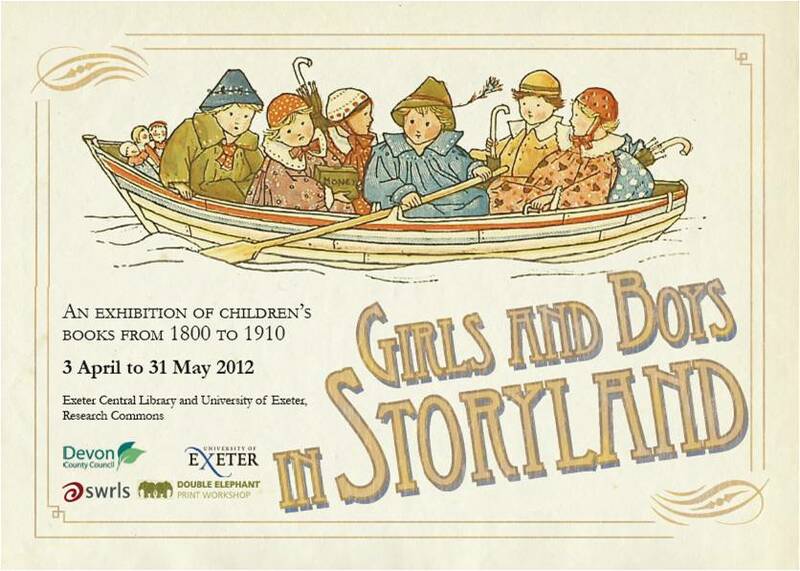 Girls and Boys in Storyland is a joint project, funded by South West Regional Library Service (SWRLS) to promote the Special Collections of children’s literature at Exeter Central and the University. On 3 April, to celebrate the launch and coincide with the start of the Easter holidays, there will be a drop-in workshop at Exeter Central Library from 10.00-15.00, run by Double Elephant. Come along and take a look at the exhibition, then create a monoprint inspired by one of the illustrations on display. The workshop is a family activity, suitable for children aged 4 and upwards. There will also be a series of talks and tours of the exhibitions. For further details about dates and times, and to book a place at one of these, please visit: http://www.girlsandboysinstoryland.eventbrite.co.uk/ . The exhibitions will give you a chance to see how boys and girls were depicted in rhymes, stories and illustrations from the nineteenth- and early-twentieth centuries. They run until 31 May 2012. Please do visit and spread the word to anyone you think may be interested! This entry was posted in Research Commons, Special Collections on 30th Mar, 2012 by Susan Abbott.